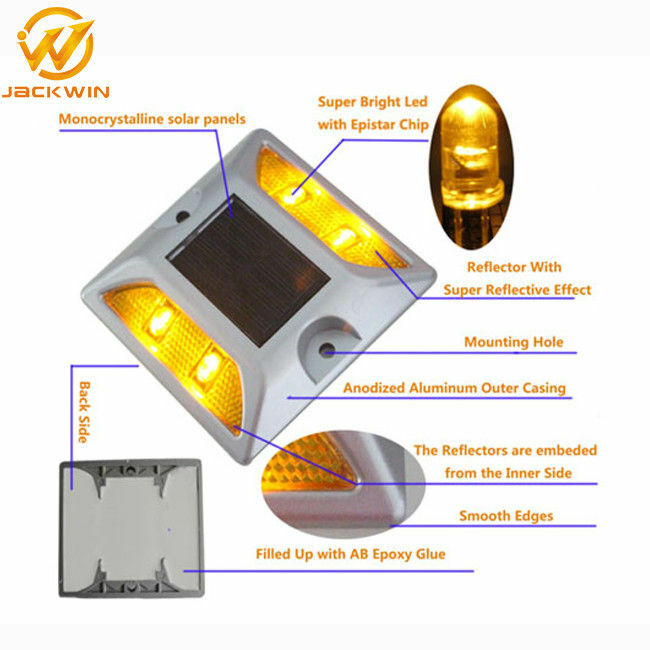 This solar aluminum road stud is designed for highway,crossing / lane divider roadside with single lens or double lens cover 2 LEDs for each lens for driver warning signal to make more safer in traffic control systems. Solar Road Stud / Solar Road Marker is a protruding sign. 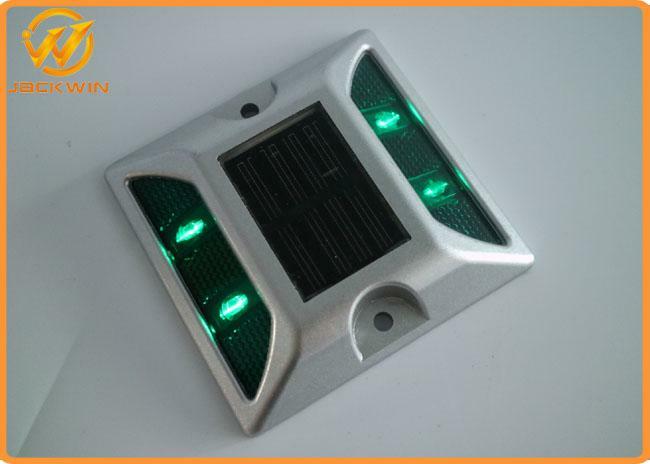 It's self-luminous, energy supply by solar panel and durable Ni-mh battery. Generally used for paving road ,used at night or in the rain and fog weather, and sketched the outline of the road, to improve road safety. Weight capacity at least 30 tons,consistant working time at least 15 days after one time fully charged, with 3 years quality guarrantee and optional color for option. 1. Aluminum outer casting with anodized coating. The anodized coating of outer casing protect it from being oxidized and it look smooth and nice. 2. Reflector embeded from the inner side. 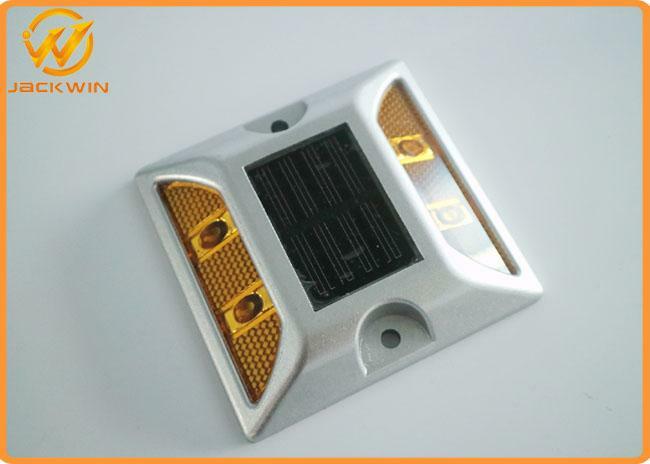 The reflector embeded from the inner side,which is lower than the surrounding aluminum and not easily be damaged,reflective sheet inside coated with layer of film avoid eroding reflectors.The lifespan of reflectors is extend effectively. We filled up the solar road stud with AB epoxy glue,it is solid inside,it had high performance on waterproof,it can get protect lever IP68 and can anti 30 tons pressure,it is widely used in the pool. The led is very bright,it is visible from 1000 meters and the lifespan is as long as 100000 hours,it won't get fade and die out during usage. The aluminum frame with smooth edges is sand-blasted,the solar road stud is no harm for the tires,and could extend the wheels life span. a.First use a ruler to determine the installation location,to ensure that the location of the vertical are in a straight line,the installation distance according to the design requirments,the installation ground need to be flat,dry,clean,seamless. Put the solar road studs in the installation position and set the screw position. Move the solar road studs and dig the hole with drill for the screw,knock the screw the hole with hammer.Put the solar road studs on the screw and fit the nuts for the screws. Put some cement on the nuts to fix the screws.